results on 7 years of additional data from 1998 through 2004.They call this an out-of-sample validation, yet they mention elsewhere in their paper that they determined the look back period and number of funds to invest in by looking at a longer span of data that includes the entire 1998 through 2012 period. To split a modest amount of data in half and call part of it an out-of-sample test is not correct. No one can tell how many times they may have repeated this procedure. With respect to their results, eight years of data is a small sample size for determining model parameters. Their results on 7 more years of data may look decent because momentum is so robust that most parameters over a certain range work out OK. However, back testing on eight years of data may not give what are the best parameter values. Elsewhere, the authors' paper can also be confusing. Here is an example, "Sometimes our relative momentum is called relative strength (RS, see Faber 2010) or time series momentum (see Thomas 2012). 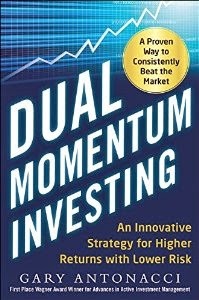 We will also use the term return momentum to contrast better with volatility and correlation momentum." Time series momentum is different from relative momentum (See my post Whatchmacallit). Furthermore, what they call volatility and correlation momentum has nothing to do with momentum. Momentum is about selecting assets based on persistence in performance, either against their peers (relative momentum) or against themselves over time (absolute momentum). The authors actually use volatility and correlation as ranking factors. The authors end up ranking assets using arbitrary weights of 1.0, 0.5, and 0.5 for return momentum, volatility, and correlation, respectively. They do not explain how they came up with these weightings. I would be cautious about using the information in this paper without doing considerably more analysis and back testing. "Time Series Momentum Versus Moving Average Trading Rules," by Marshall, Nguyen, and Visaltanachoti is an academic paper that attempts to determine if long-only momentum trading rules beat comparable moving average trading rules. They do this by comparing absolute momentum (which they call time series momentum) to comparable (according to them) moving averages of size based quintiles of US stocks using 10, 50, 100, and 200 trading day look-back periods. They have confidence in their comparisons because their correlations between momentum and moving average returns are generally in excess of 0.8. However, this may have something to do with their use of daily, rather than monthly, data. Since momentum is an intermediate term anomaly, most researchers study it using monthly returns. 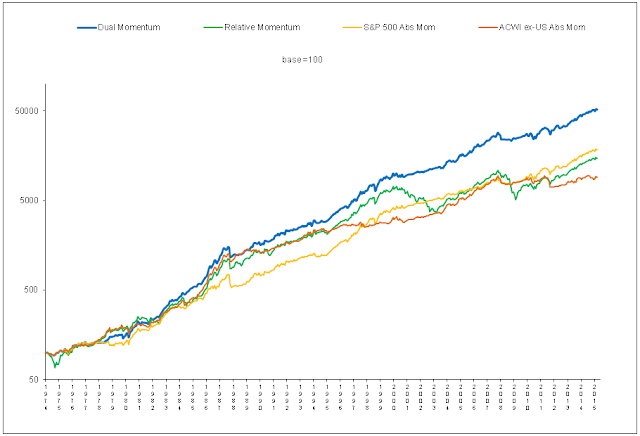 We get correlations ranging from 0.45 to 0.47 when comparing 12-month absolute momentum monthly returns to a range of 4 to 32 month moving average monthly returns of the US stock market for the past 38 years. We use a range of moving average lengths because one cannot just use the same look-back period for momentum and moving averages and expect comparable results. The authors hint at this themselves when they say that moving averages enter and exit stocks sooner. Their paper also identifies the average holding periods for look-back intervals of 10, 50, 100 and 200 trading days as 8, 22, 31 and 47 days for moving average rules, and 10, 32, 46 and 83 days for momentum rules. Quicker entries and exits with moving averages means that their lengths should be longer if one expects their performance to match up with absolute momentum. Choosing the same look-back period does not make absolute momentum and moving averages comparable. An old investment adage is that moving averages should be plotted half their length behind the current price on a stock chart. A half-span lag means that the look-back period for a moving average would be twice as long as the look-back period for momentum in order for the two to be roughly comparable. Stocks are in size-based quintiles from Q1 (small) to Q5 (large). Look-back periods from 10 to 200 days are in the first column. Reading across the rows, the Sharpe ratios are for moving average (MA) and absolute momentum (TSMOM) strategies using the same look-back period. We see, that except for Q5 (large), if we shift the MA strategies up one level so that their look-back periods are twice as long (or longer when going from 50 to 10) as the TSMOM look-back periods, we get an almost exact match of the Sharpe ratios. Based on using such shifted look-back periods that make MA and TSMOM strategies roughly equivalent, one can no longer say that portfolio-timing rules based on moving averages clearly outperform their absolute momentum counterparts.